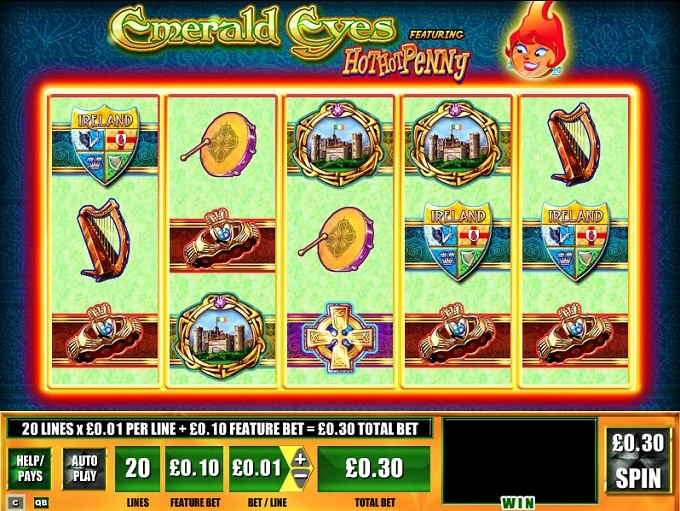 The theme in Emerald Eyes is based on the Irish, though we get a look at their history and medieval heritage in this game, and not just a focus on leprechauns and pots of gold, like very other slot machine does when it gets this theme. This game was created by the developers from WMS. Based on the quality of the design, and the features which are at least decent, I’d say that it offers you plenty in exchange for the money you wager when you play it. Once Emerald Eyes has loaded, you’re going to find that the slot has 5 reels and on them up to 20 paylines can be active. 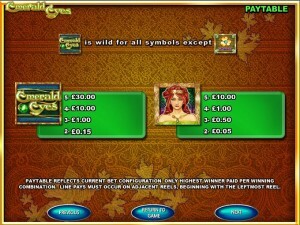 Give the game a chance, and while you play you will find re-spins, scatter symbols, wilds and free spins. You can even win prizes of up to $15,000. 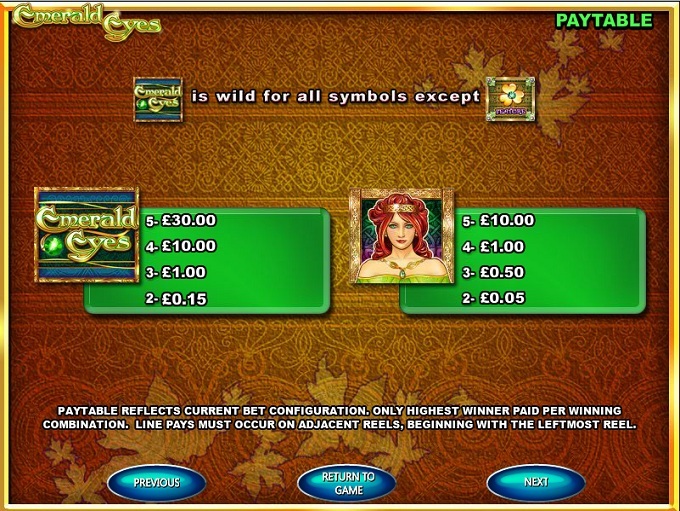 The game offers you wild features, scatter symbols and free spins. It’s not the most satisfying list of features you’ll ever see, but it will do. The wild’s role is of course to act as the substitute for another symbol, but only if there are other matching symbols already on that payline, and the missing one is in the spot where the wild has landed. It will happen often enough, though not every single time the symbol makes an appearance. It will not happen when scatters are involved, as the wild can’t replace that kind of symbol. From time to time, you will find that multiple wilds have landed together on a line, and going from left to the right, in consecutive order. If that’s the case, you will get a prize out of it, which has a minimum value of 15x for two symbols, and of 3,000x for all five. 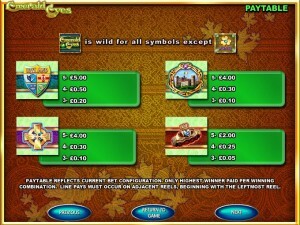 The other symbol with a big role in this slot is the Shamrock, used as a scatter icon. If you have two of these symbols on the reels, the Re-Spin feature is activated, and the other three reels re-spin for free, in an effort to get you to the minimum of three scatters, which activate the free spins. 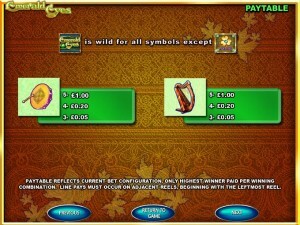 With at least three Shamrock symbols on the reels, you are given access to the slot’s 8 free spins. Whenever you get the image of the Redhead Queen on the reels, a picking bonus feature will start, where you have to choose one of the three Emeralds in order to get a prize. The payout will be anywhere between 2x and 20x the total bet. Activating the free spins again is possible, as long as the requirement is met once again, and you have 3+ Shamrocks scattered on the game reels. You place your bets with 30 coins, out of which 20 are for the lines and 10 for the features. The betting range is between $0.30 and $150, thanks to the coin’s value which varies from $0.01 to $5 (the line bet is the coin value). Winning the top prize, which gives you 3,000 coins, will put up to $15,000 in your pocket. It’s an interesting design that we’re offered here. 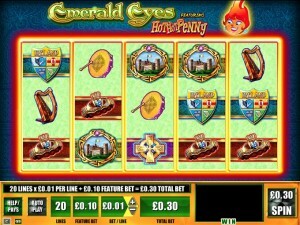 It might be inspired by the Irish people, but not by their legends, which are so often the focus in these slot machines. Instead, you get a look at their history and their heraldry, at castles, musical instruments and the crowns that their kings wore. While I don’t say this very often about Irish themed slot machines, I think this is one of the titles you should try and see what it’s all about. Symbols: Emerald Eyes Logo (wild, 3,000 coins), Shamrock (scatter), Redhead Queen (1,000 coins), Ireland Heraldry (500 coins), Irish Castle (400 coins), Irish Cross (400 coins), Crown (200 coins), Drum (100 coins) and Musical Harp (100 coins). 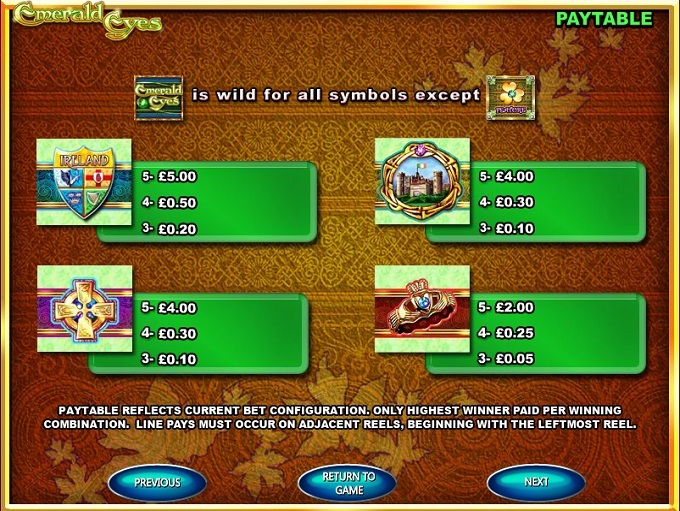 It’s a very different Irish themed slot machine, so even though the topic has been approached plenty of times in the past, none was made quite in this way. I recommend you try it out. You will find Emerald Eyes at any online casino which chooses to use software from WMS, playable either for free or for real money.